1. Download and install the "SwiftFinder" free APP works with ISO and Android system. 4. 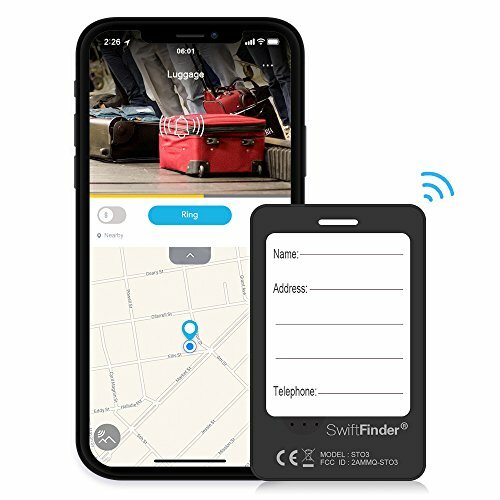 Follow the prompts to allow "SwiftFinder" access to Bluetooth and location service on your phone to track your belongs on the map. The new Bluetooth tracker device is under sleep mode until being activated by switching on the button. You'll hear a ring tone then complete the connection with your phone in a minute. It will back to sleep mode without connection automatically. It can be anything that you want to track, luggage, baggage, suitcases, bags, etc. Linking Your Smart Tags to the App. 1. Tap the + button on the Things tab of the App. 2. Wait for the App to discover and connect the smart tag. 3. Tap the save button on upper right corner of the App. 4. Optionally you can take a picture of the thing that the smart tag is attached to and name it. 5.Don't worry about the losing of your luggage again. ✈Luggage Tracker with App: - This is a Bluetooth tracker tag connected with Smartphone via APP, which will remind you about the whereabouts of your baggage nearby. Both the tracker and your phone will alert you with a ring tone when luggage is out of a safety distance. Never forget your luggage in airport or Starbucks anymore. One APP is available for multipling baggage tracker connections, safe trip for you and your family. ✈Accurate Locator Tags: - The smart suitcase tracker could connected to 50 meters in open area such as airport, distance might be shortened by heavy roadblocks. When your luggage is out of the track distance, the App will record the latest location details and time on the built-in map which is able to guide you there. Once you are approaching your luggage, the tracker device will reconnect automatically. ✈Wide Usage in Travel: - Simply attached to your valuable belongs, suitcases, carry-on bag, computer backpack, baby stroller, even bike etc. Highly recommend for business trips or family vacations. ✈Superior Power Capacity: - The lifetime of the battery is up to 5 years, never worry about powerless. The luggage finder includes 4 x CR2032 irreplaceable batteries. ✈High Quality & Reliability: - High quality ABS material design provides the luggage tracker steady robust surface with strong scratch resistant and water resistant. If you have any questions about this product by Toksam, contact us by completing and submitting the form below. If you are looking for a specif part number, please include it with your message.